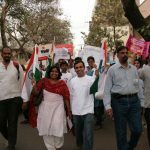 When spirit overcame the boundaries of physical limitations..
“People from IT profession are normally busy and get up late on Saturdays, weren’t you surprised to see 400 people turn up for the Dandi March 2?”, a journalist asked me yesterday. My reply was “Considering the kind of response we got leading upto the event, I was surprised to see ‘only‘ 400 people turn up”. But there was one thing which surprised me, around 200-250 people walked the full distance of 11 km which took around 4 hours. Considering the weather which was quite hot (despite a light drizzle the previous evening), I watched as many people kept on walking despite having pain and discomfort in their legs. I think the joy and excitement of being a part of something good diminished the physical. So how did I get these IT professionals to ‘pick their lazy asses’ (as another friend put it) and walk for the country. Frankly speaking, I did nothing but spread the word about what we are doing and why? 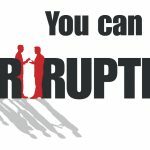 I think we all feel for the rampant corruption in India today and are frustrated because of it. We (IT professionals) don’t always seem to care because it doesn’t really pinch us directly, and we see no hope from the prevalent situation. 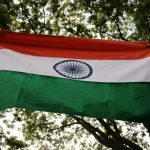 That builds on the resignation and cynicism about the current situation in India. Also we don’t see any options to show our frustration and anger in a collective way. 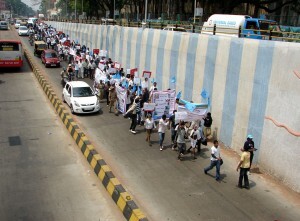 So I think this walk against corruption caught the fancy of people and they were motivated enough to get up at 6 and reach the venue at 8 in the morning. 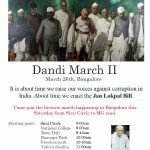 After all, people are not lazy, it is the situations which call people into action, and Dandi March 2 was one such opportunity to show they care for their country. But what surprised me more than the 400 people turning up was the number of people who walked the full distance. I walk a lot, so I know it is not easy to walk more than 5-6 kms in one stretch if one is not exercising regularly. That too under the hot blazing sun in temperatures around 35 degree celcius. I had many of my friends and colleagues walk during the march, and I was totally surprised with almost all of them walking the full distance. What’s ironical is they disregarded my advice of leaving after a few kms and continued to march despite many of them having pain, cramps and discomfort in their legs. After all, it is the spirit which matters. And like my friend Tripti, who was on painkillers for the last two days put it, “I will not regret it at all, if something fruitful comes out of this”. It is about hope, hope for change, for a better tomorrow which propelled people to walk together to show they care. 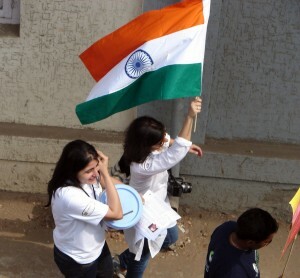 “I decided to act and became the part of the Dandi March II held on 26 March 2011. I reached the staring point at 08:00 AM and realized the enthusiasm of each and every person there. The feeling was very special and i was remembering each and every freedom fighter of India. I was realizing how it actually feels when you decide to lead from front or be the part of it. 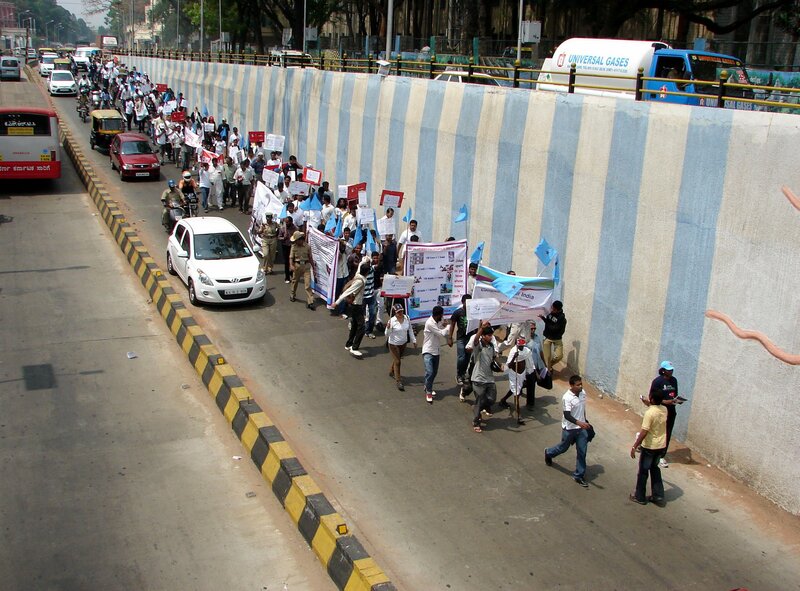 We started the march and we finished it without having any sort of pain. It was all enthusiasm which was driving us to make it happen successfully. That was the time when I realized one fact that ‘Don’t wait for the change, instead be the change'”. Seeing such participation and commitment from people towards the cause of a corruption free India, I have no doubt we have a great future ahead of us. We might be plagued by many problems right now, and there might seem to be no end to the tunnel, but this Saturday we saw and witnessed the light at the end of it. It might take some time getting to the end of the tunnel, but considering the enthusiasm in the youth of today, I am sure it will turn into a collective movement with people from all walks of life joining.